Happy Tuesday Ya'll!! It's hard to believe another weekend has passed us by and we're almost halfway through our week already. Man time sure flies when you're busy cooking! You know, I've been holding onto this recipe for awhile, because in all honesty it's not all the special. It's not fancy, it's something just about anyone can come up with, and I already have a ton of breakfast foods on the blog. But here's the thing... So few of them are really a weekday, throw together and feel healthy breakfast food, and since that is something I know is important in my life I thought it was time to share! If using homemade granola make that ahead of time. Then slice up your fruit. In a pretty glass, layer your parfait. 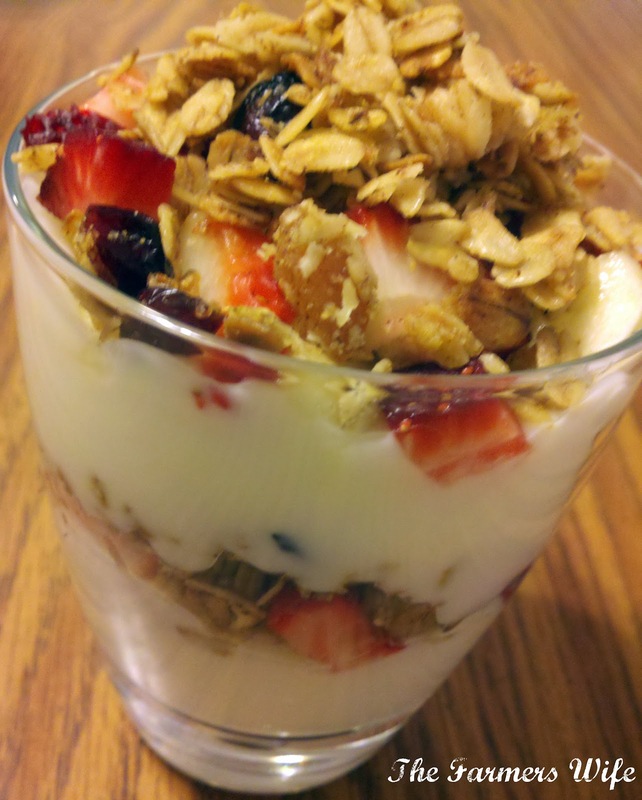 Yogurt first, then fruit, then granola. Repeat until glass is full and yogurt and fruit are used up. Serve immediately or chill for up to 1 hour. What I love SO much about this is you can totally change up the flavor by using different flavor's of Yogurt or different kinds of fruit. Also if you make your own Granola you can add whatever spices and dried fruit you want to that, making this recipe SO versatile! Also a little tip, Wal-mart's Low-fat Yogurt is not only cheap but a 6 oz. container is only 80 calories! Lower than most low-fat yogurts! 4 stars. Don't forget to tune in this Friday for another Friday Featured Guest Post, this week with Lauren from Forever Now and Then! Oh such a healthy breakfast meal! If I eat this everyday I think I would be much thinner... I tend to eat carbs like 1 big bagel and crossoint.... This one is quite inspiring! I love parfaits, and I would love to wake up to one of these! That would be one awesome start to my day... yummylicious, Kim! I'm a total breakfast foods kinda gal too. I NEVER miss breakfast. It throws me all off if I don't eat in the morning. Love this. Of course, I could eat this all day long..not just breakfast..lol. I really need to try and eat healthy starting with this! This looks awesome Kim..I would eat this for breakfast, dinner or dessert haha...great delicious and refreshing recipe! Oh wow Kim, I would be delighted to have this any time of the day! Yum yum yum! What a great breakfast!! I really really like this! I never bring breakfast to work, but should. I'm just lazy in the morning. THis is something that would taste delish and not be time consuming! Can't wait to try it! Your parfait looks delish, and healthy, too. We sometimes make a version of your parfait fro a light, healthy dessert. gotta love that yogurt! Thanks Ya'll!! I too eat this for dessert sometimes, it's just so refreshing and yummy! I hope you like it! It may be simple, but it is quite pretty. Great, healthy breakfast item there. Somewhere in my reading blog posts this weekend, I saw a breakfast parfait that had the fruit (like kiwi, bananas and strawberries) sliced and arranged very artistically. Which I could remember!?!?!? !